Over the past six months EGM’s Little Town of Bethlehem has been selected to be screened at numerous film festivals and other events, receiving top honors at two of the film festivals. National and international film festivals and other events are recognizing the quality of EGM’s films with a growing number of screening invitations. 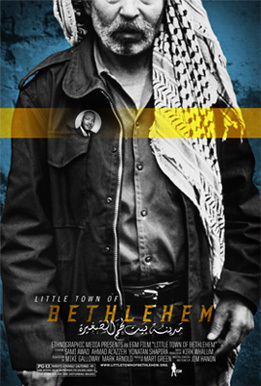 Little Town of Bethlehem was selected for such diverse venues as the Life And Death Matters Film Festival, Beverly Hills Film Festival, Chicago Palestinian Film Festival, John Paul II International Film Festival, Southern Utah International Documentary Film Festival (DocUtah), Arizona State University Film Festival and Symposium, Wild Goose Festival, Heartland Film Festival, Gandhi-King Peace Conference, Missions Fest Film Festival, deadCENTER Film Festival, Pentecost Festival, Grand Rapids Film Festival, and San Francisco Film Festival. In February, Little Town of Bethlehem received the Reel Rose Award for best documentary film at the John Paul II International Film Festival held in Miami, Florida. It was also nominated for the audience choice award. The John Paul II festival plays host to faith-based filmmakers and creative artists from around the world. It was inspired by the ideals and vision of Pope John Paul II as articulated in his influential 1999 Letter to Artists challenging them to respond to the world’s need for truth, love, and peace through the use of art. In its third year, the festival brought together feature films and shorts along with ten documentaries, one of which was EGM’s. This year’s festival took on even greater significance for the nonviolence message of Little Town of Bethlehem in light of Pope Benedict’s call for a peace summit to halt violence between religions. Little Town of Bethlehem was recognized with the Best Oklahoma Film award at the deadCENTER Film Festival in Oklahoma City. The June festival showcased more than 100 films from diverse perspectives appealing to a wide variety of tastes, ranging from hilarious comedies and inspiring, thought-provoking documentaries to visionary shorts and offbeat musicals.